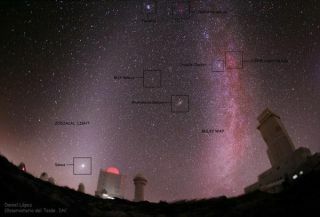 The zodiacal light can be seen as a cone-shaped glow above the planet Venus on the left-hand side of this image. To the right in the image is the concentrated glow of the Milky Way galaxy. The Full Moon of February is usually called the Wolf Moon. In Algonquian it is called Snow Moon. Other names are Hunger Moon, Storm Moon, and Candles Moon. In Hindi it is known as Magh Poornima. Its Sinhala (Buddhist) name is Navam Poya. The Full Moon rises around sunset and sets around sunrise, the only night in the month when the Moon is in the sky all night long. The rest of the month, the Moon spends at least some time in the daytime sky. The First Quarter Moon rises around 10:30 a.m. and sets around 2 a.m. These two planets will be in the same field of view in a small telescope. Venus will be 0.3 degrees north of Uranus. These two planets will be in the same field of view in a small telescope. A pretty grouping of the planet Saturn, the bright star Spica, and the waning gibbous Moon. A pretty grouping of the planet Saturn, the bright star Spica, and the waning gibbous Moon occurs on Sunday, Feb. 12, 2012. On successive nights, the Moon will be close to the planets Venus and Jupiter. On February 25, 2012, the Moon will be close to the planets Venus and Jupiter. Mercury will be well placed as an evening “star” during the last week of February. Venus is a brilliant object in the evening sky after sunset all month. The waxing crescent Moon will pass close to Venus on Sat. February 25. Mars returns to Leo on February 4. It grows in size from 12 arc seconds to 14 arc seconds during the month, as large as it will get during this apparition. By the end of the month it reaches magnitude –1.2, heading towards opposition on March 3 and its closest approach to Earth on March 5. Mars rises around 9 p.m. and shines brightly the rest of the night. Jupiter continues to be well placed in the evening sky all month in Aries. Jupiter and Venus are the brightest objects in the evening sky other than the Sirius and the Moon. Saturn rises around midnight, and is visible the rest of the night. It now shines brighter than nearby Spica. Uranus is close to Venus on February 9, but is sinking low in the western sky. Neptune is too close to the Sun to observe, being in conjunction with the Sun on February 19.